Projects in regulated environments have to follow strict guidelines and rules. Laws, normative regulations, product risk analysis, and detailled development processes are defined and controlled by Quality Management departments. Besides of that you have to deal with external groups like editorial staff for documentation. Documentation can’t be translated on a User Story basis every time something changes. This would get too expensive and it is much easier for an external translator if she has the final document ready at hand. Nevertheless a translation into a dozen languages may take up to 4 weeks. System Release Testing can’t be started until everything is finished and shippable. Unfortunately some unexpected behavior on a User Story basis may be reported which need instant action (code adaptation, re-documentation, re-review, re-testing). Quality Management departments traditionally follow a very waterfalling approach. After every other thing has beed finished they start to look at a project, do some reviews, read project documentation, and – worst of all – start asking questions and suggesting changes here and there. These changes may have impact on single User Stories. So how do we deal with all these „Dones“? „documentation drafted“ from Documentation to Development: sketch the documentation changes for every single User Story. I recommend to find a semi-team member in the documentation department and deliver all drafts after each sprint to her for a first review. „risk analyzed“ from Quality Management to Development: think about product risks of every single User Story. Again I recommend to closely work with a QM guy after each sprint. 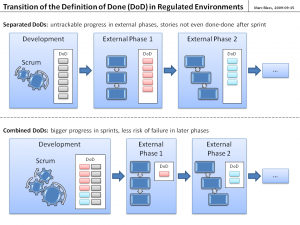 With this approach we are able to strengthen the DoD we are tracking in our Daily Scrums. We move as many tasks as possible to the early development phase and thus we handle risky things right from the start. 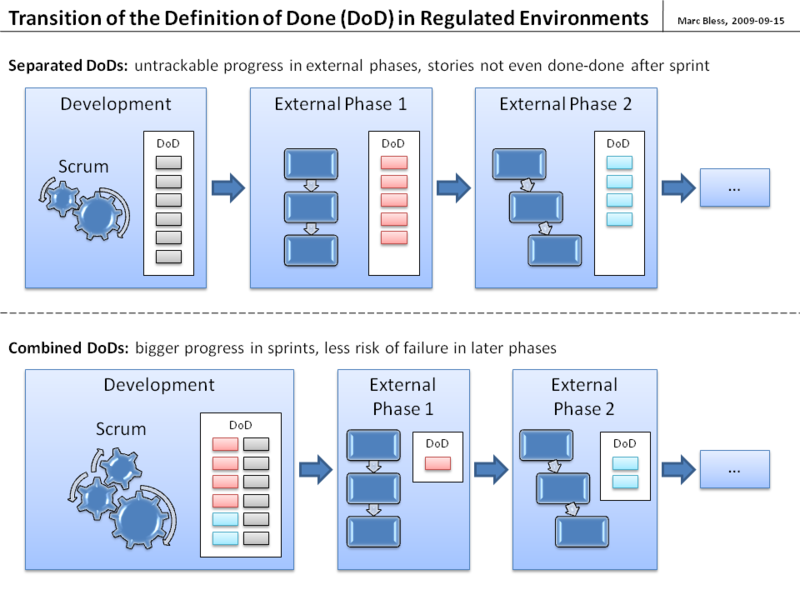 The big advantage of more early „Dones“ is the expansion of the agile, iterative development phase. Agile progress tracking can unfold its power with much more tasks being finished during development. As a result all later phases have less risk of failure.